Connects to your cable provider's network (service required; check for availability). 24 downstream and 8 upstream channels provide efficient and reliable Internet access. Connects to your cable provider's network (service required; check for availability). Supports DOCSIS 3.0, 2.0 and 1.1 services. for maximum speeds of up to 960Mbps for downloading and up to 240Mbps for uploading. Helps you eliminate modem rental charges. Owning your cable modem saves you money in the long run with many cable providers. Everything you need to get started. Includes power adapter, phone cables, Ethernet cable and CD-ROM. Set up is quick and easy. Learn how upgrading to a DOCSIS 3.0 Cable Modem can maximize Wi-Fi speeds. Works with all major cable providers. Upgrade to a powerful modem to maximize Wi-Fi speeds. Multiple channels support speeds of up to 960Mbps. Works with any wired or wireless router. Maximize Internet speeds to your Wi-Fi router with the Linksys 24x8 Cable Modem (CM3024). It delivers stable high-speed connectivity for existing Internet service plans of up to 300 Mbps , so you can enjoy simultaneous media streaming, online gaming, and web browsing. Note: Cable customers with Internet speeds of up to 100 Mbps should use the Linksys CM3008 Cable Modem. Owning your own modem allows you to eliminate rental fees from your service provider. 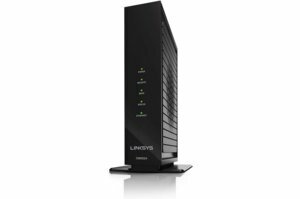 The Linksys CM3024 Cable Modem is certified to work with Internet service plans from major cable providers, including Comcast Xfinity, Time Warner, Cox, and Charter--providing savings up to $120 a year on modem rental fees. Maximize the data transfer speeds of your current Internet service plan with 24 download and 8 upload bonded channels on the CM3024 modem. These multiple bonded channels enable you to optimize media streaming and file transfers using the CM3024 by simultaneously transferring large amounts of data over many channels. The result is more effective and efficient usage of your existing cable broadband connection. Certified for DOCSIS 3.0 cable Internet standard, this powerful modem can handle high-bandwidth transfer rates over existing cable lines with speeds of up to 960 Mbps. To achieve high-speed downstream and upstream performance, the Linksys CM3024 Cable Modem features an Intel Puma 6 chipset. Designed to be a flexible and high-performing solution, the Puma 6 chipset will facilitate cutting-edge data service offerings as technology continues to advance.